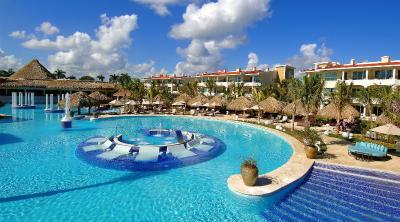 Lock in a great price for The Reserve at Paradisus Punta Cana - All Inclusive - rated 8.7 by recent guests. Th staff did such a wonderful job at meeting our needs. Any time we made a request, it was taken care of quickly. There were so many activities for people of all ages. The entire staff was so kind to children. Our concierge, Jarol, was so professional , warm and attentive. We will definitely go back. Ask for Budweiser if you doesnt want Presidente, they can fill your minibar. Great place to relax. Great food and great service!!! The resort was beautiful, rooms were very spacious, however the tv and air conditioner did not work in the bedroom/bathroom and in the 6 days we were there they never came to fix them☹️ Food was average at the buffets and room service food was not good at all. We did not eat at the restaurants, so I don’t know about them. The free bikes are terriblely uncomfortable and old. La limpieza, comodidad, el servicio del personal, la comida y bebida, entre otras cosas. Para ser un hotel costoso: Excelentes instalaciones, muy limpias y tranquilas. El personal es muy atento, amable y servicial. Las habitaciones son de primera calidad, bien equipadas y con baños higiénicos. Excelente servicio a las habitaciones. Очень тихий ресторан со шведским столом, неплохо кормят. Большой выбор ресторанов, где можно покушать. Хороший детский клуб. Ухоженная территория, хороший широкий пляж. 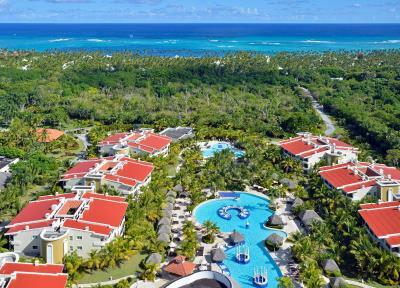 Отель находится на территории отеля Paradisus Punta Cana, и практически Все объекты общие. Отличный тренажёрный зал. Несмотря на все минусы, это один из самых комфортных и хороших отелей в Доминикане. Da beleza do hotel, acomodação, comida e bebida! O tratamento do pessoal é excepcional! Um paraíso!! 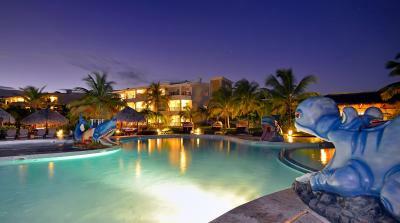 The pool and the beach are beautiful. The inclusive buffet restaurants were filled with children so I wouldn’t rate this as a romantic getaway but as a family resort. One of our top picks in Punta Cana.Set within the all-inclusive Paradisus Punta Cana, The Reserve offers luxury suites, a private lounge, a swimming pool and a kid’s pool with slides. 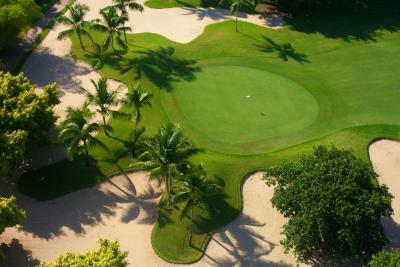 The resort has a private beach, golf course and spa. 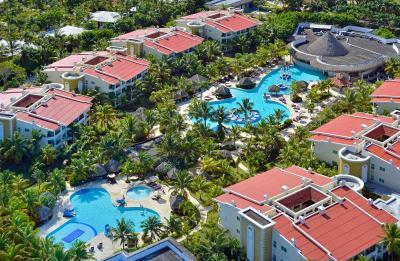 Suites at the All Inclusive The Reserve at Paradisus Punta Cana offers a terrace or balcony, free WiFi, cable TV and individually controlled air conditioning. Tea and coffee are included and the minibar is restocked daily. 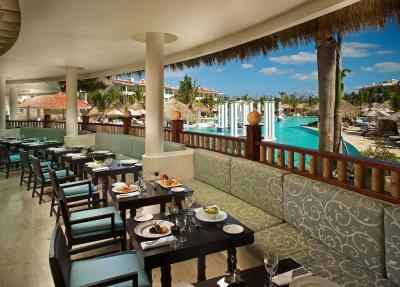 The resort has 8 bars and 11 international restaurants, including Mediterranean, Japanese, Brazilian and Spanish restaurants. Room service is available 24 hours a day. 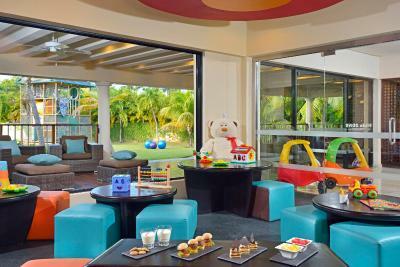 The Kids Zone offers a children’s club with supervised activities. 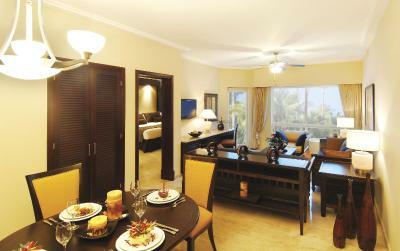 Family rooms with special amenities for children are also available. 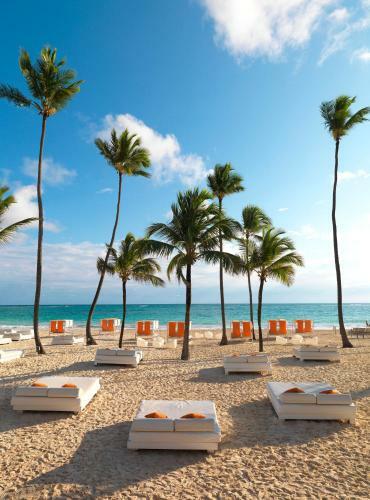 The Reserve at Paradisus Punta Cana is a 15-minute drive from Palma Real Shopping Village, while Manati Park is a 10-minute drive away. 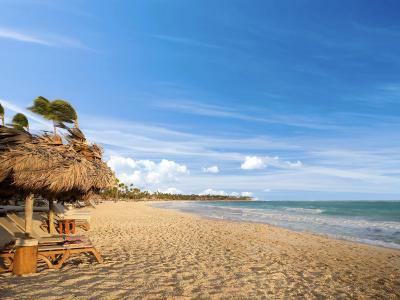 Punta Cana International Airport is a 20-minute drive away. 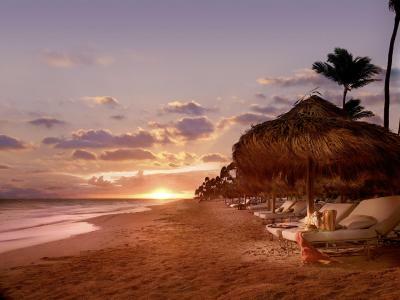 Bavaro is a great choice for travellers interested in sunbathing, excursions and water sports. 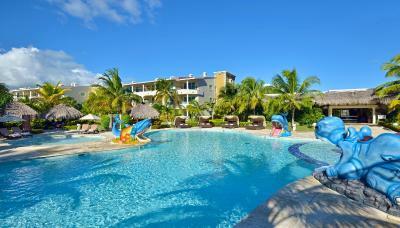 The Reserve at Paradisus Punta Cana - All Inclusive has been welcoming Booking.com guests since 5 Apr 2013. 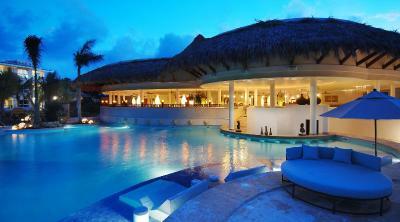 When would you like to stay at The Reserve at Paradisus Punta Cana - All Inclusive? This spacious 1-bedroom suite has a luxurious bathroom with a 2-person Jacuzzi®, double sinks and deluxe amenities. There is a separate lounge area with a sofa bed. 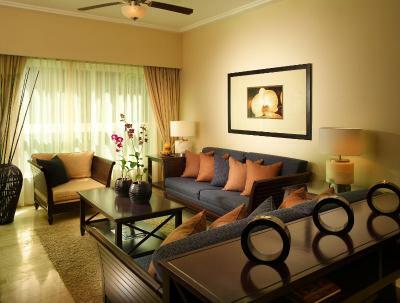 Tea, coffee and a minibar with daily replenishment are included, and free Wi-Fi is also provided. This spacious 1-bedroom suite has a luxurious bathroom with a 2-person Jacuzzi®, double sinks and deluxe amenities. There is a dining area and a separate lounge area with a sofa bed. 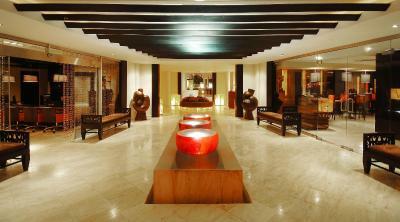 Tea, coffee and a minibar with daily replenishment are included, and free Wi-Fi is also provided. This spacious 1-bedroom suite includes a personalized concierge service, free mobile phone use, a PlayStation (on request) and a kid's beach kit with a hat, T-shirt and sunscreen. 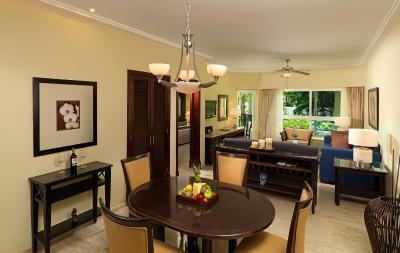 It has a luxurious bathroom with a 2-person Jacuzzi®, double sinks and deluxe amenities for the whole family. There is a separate lounge area with a sofa bed. 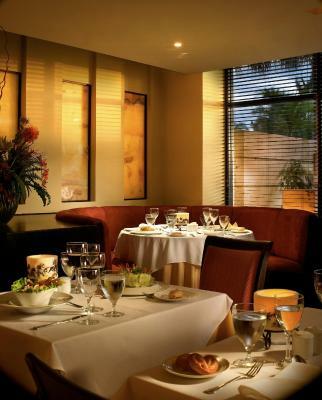 Tea, coffee and a minibar with daily replenishment are included, and free Wi-Fi is also provided. The nightly turndown service includes milk and cookies for children. 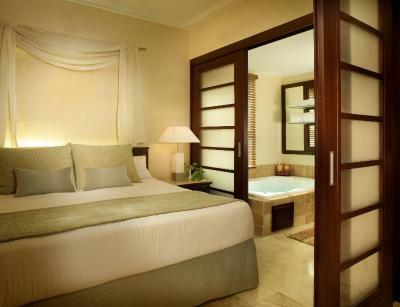 It has a luxurious bathroom with a 2-person Jacuzzi®, double sinks and deluxe amenities for the whole family. 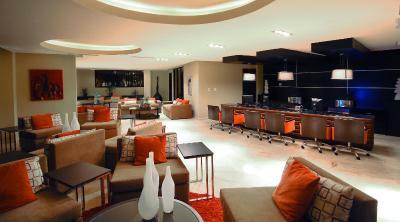 There is a dining area and a separate lounge area with a sofa bed. 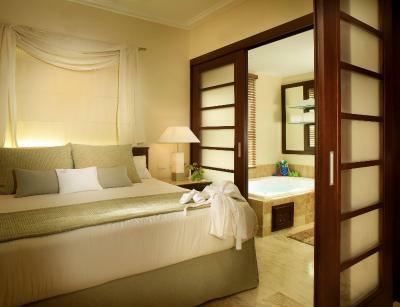 Tea, coffee and a minibar with daily replenishment are included, and free Wi-Fi is also provided. The nightly turndown service includes milk and cookies for children. 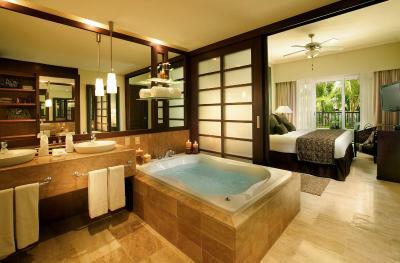 This suite features a balcony and spa bath. This suite features a balcony and hot tub. 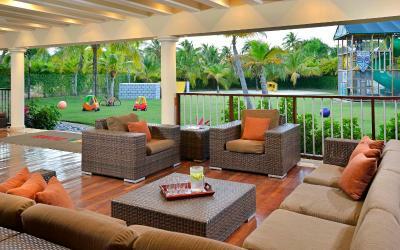 This family room features a balcony, air conditioning and executive lounge access. This family room has a balcony, cable TV and tile/marble floor. This suite has a balcony and spa bath. 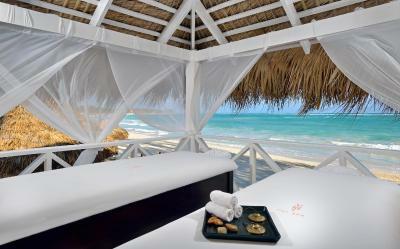 House rules The Reserve at Paradisus Punta Cana - All Inclusive takes special requests - add in the next step! 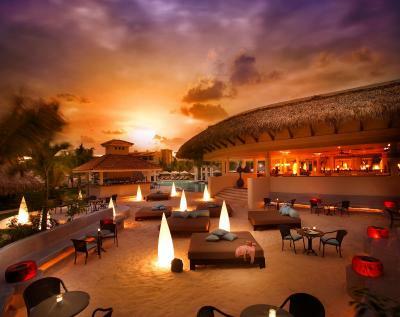 The Reserve at Paradisus Punta Cana - All Inclusive accepts these cards and reserves the right to temporarily hold an amount prior to arrival. Please note extra costs for children are not included and will be charged at check-in. One Child Free! Book now and until May 31st 2019, and stay from April 01st to December 20th 2019: One child 12 years old and younger stay and eat free when sharing the same room as parents. Other restrictions may apply. Check in. Room wasn’t ready until 430! The food was okay. It was as good as could be expected, given the vast quantities of people who are served. In one of the restaurants, Mole, wear lots of bug spray. My daughter got 85 bug bites there while eating. The food there was good though gh. Most of the staffs didn't have there 100% effort to the customers. The beach was too dirty, first time seeing a beach dirty in Bavaro. Checkin was a bit of a mess. Showers too small, terrace not comfortable, terrace chairs disaster. Daybed cushions abdorbe rsinwater. All time wet. Room was a bit dated. Shower was old. Food was subpar, not the quality, but the variety. No pillow menu. I went here with two friends recently. There are two Reserve hotels close to each other. I booked two days before arrival and accidentally booked the wrong one but the reservation staff switched me over. Unfortunately though, I ended up paying 100$ per night more than my friends because of the mistake. This was very disappointing. Late check-out isn't free of charge. Some staff were very moody and not informative. Poor level of english! 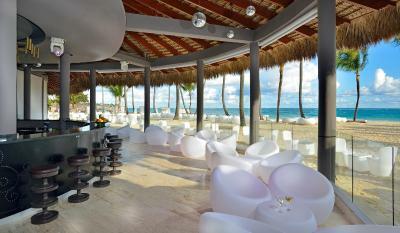 The Paradisus exceeded our expectations and more. 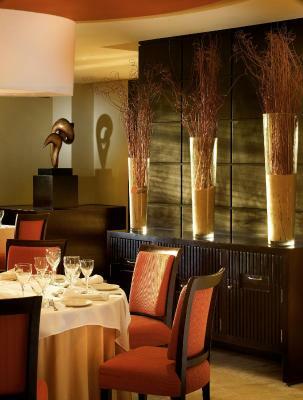 The staff were extremely hospitable, very friendly and sensitive to our needs. We were and are highly impressed with our Butler,Jandri who catered to our every need and checked in on us constantly. The rooms were extravagant, clean, and housecleaning did impeccably on a daily basis. The food served at each and every restaurant was high quality cuisine. The pool and beaches clean beyond belief and staff navigated all around to ensure you needs are met quickly and with a smile. 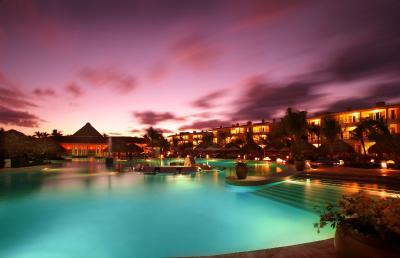 The Paradisus Resort and their staff are amazing!! We plan to visit again next year. Villas should have lifts/elevators for guests who have trouble climbing stairs. Include some activities in the cost of the room instead of them being extra. 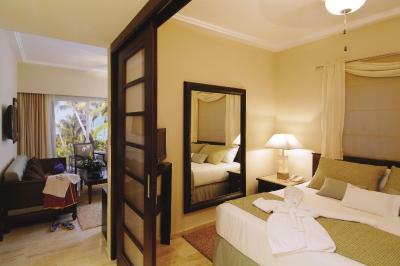 The rooms were always clean, mini bar was restocked frequently and the staff were very helpful and friendly.